Michael Berry and I went railfanning on Saturday September 3rd. 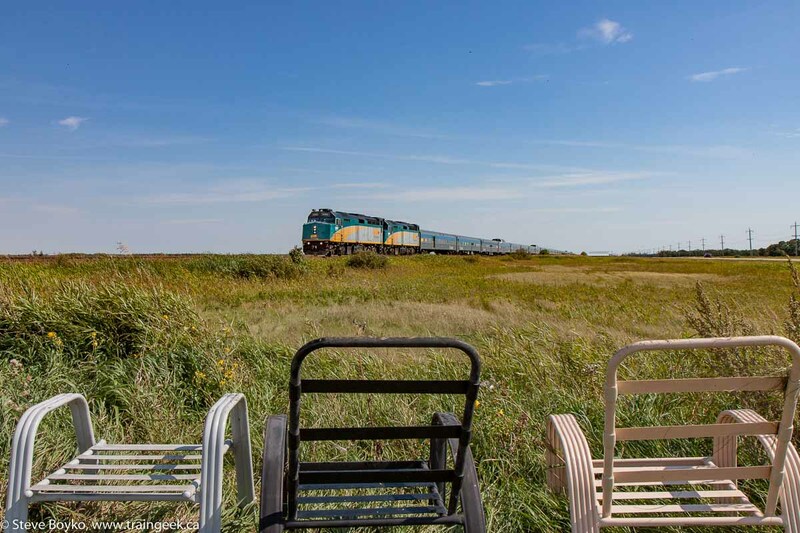 Michael is from Montreal and wanted to experience Winnipeg's railfan scene. 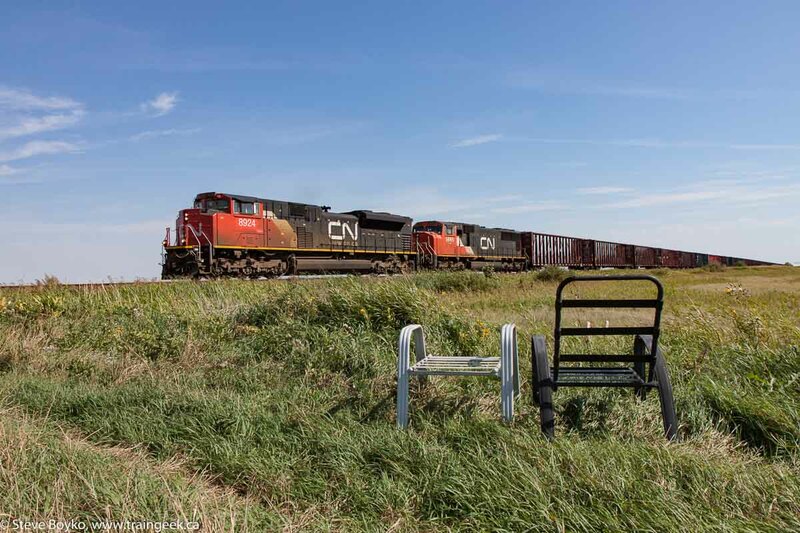 In part 1 we went to CN's Diamond and in part 2 we visited the Prairie Dog Central Railway. 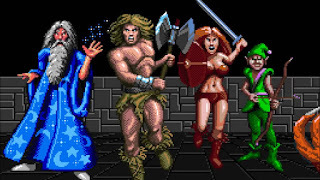 This is the third and last part of the story. 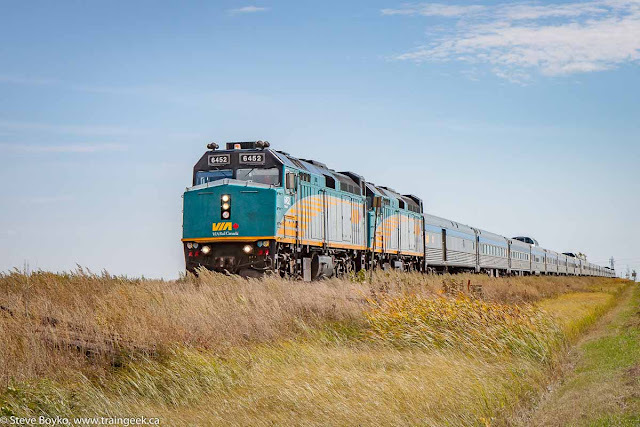 After we finished photographing the Prairie Dog Central's steam train, we drove back down the Perimeter Highway toward CN's main line. We wanted to catch VIA's Canadian out there and we didn't have a lot of time. Am I the only one here who played Gauntlet? We stopped at the Tim Horton's near the raceway on Portage Avenue to grab a quick sandwich... so we thought. The lineup wasn't long but the service was quite slow... so slow that we had to ask if our orders had been forgotten. We were reassured that they hadn't. Michael was checking the VIA web site on his phone and noted that VIA 1 hadn't left the Winnipeg station. Note that due to some quirk on VIA's site, you can't see VIA 1's status using their normal web site but you can see it on the mobile site. It's https://tsimobile.viarail.ca/ and it's important to include the "s" in https. Eventually our food came, and we raced back to my car and hit the road. 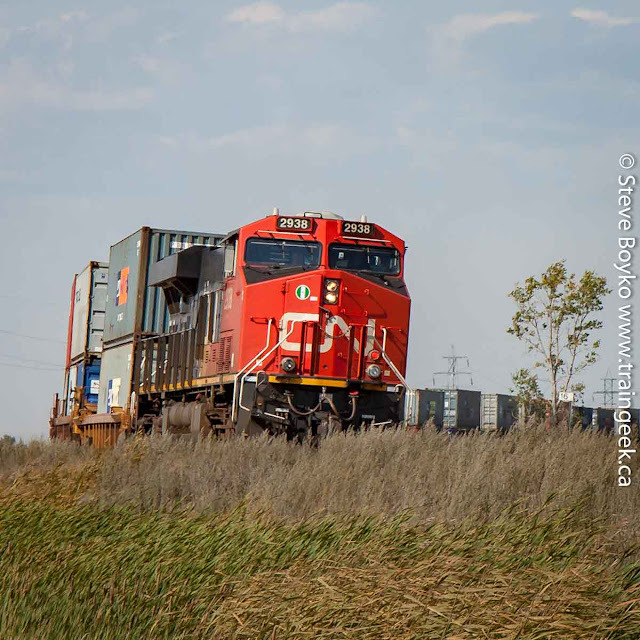 As we approached the CN Rivers subdivision, we saw a westbound intermodal train. We crossed over the train - thank you overpass - then set off in pursuit. 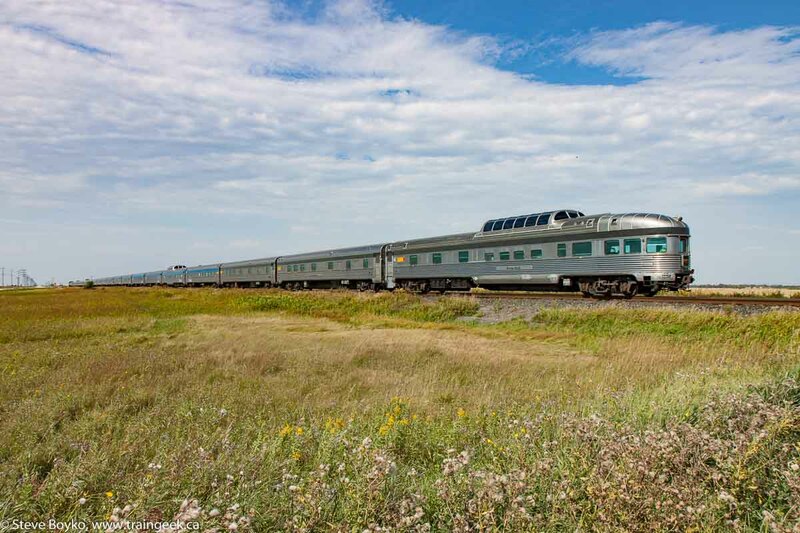 It was clear that we weren't going to catch up to the head end, but the train had a DPU on the rear, facing the sun, so it was worth chasing to get that. We caught up to it just before Diamond and we bailed out to get the shot. Trailing but still a worthwhile shot! We hopped back in and chased it for a few more kilometres, to try to get it on the curve at mile 16. I like this photo because it shows the super elevation at the curve. After a brief chat with His Honour, we set up a little east of Diamond to get VIA 1 in the wide open spaces. CN had other plans, though, and sent CN 347 along first. This train is an interesting one, certainly one of the most recognizable CN freights in the Winnipeg area. 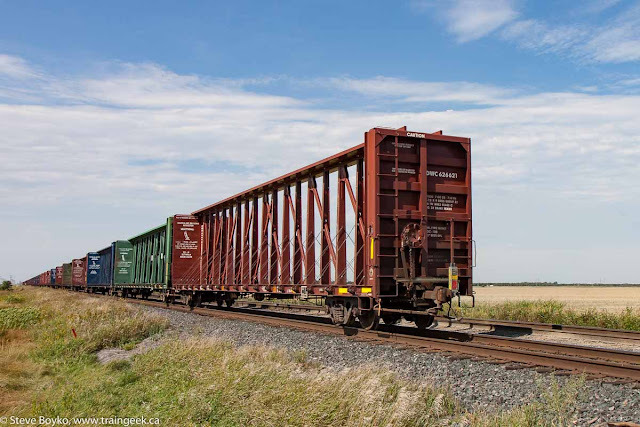 It always has a lot of empty centerbeam flatcars on it, empties going back to British Columbia for more lumber loads. 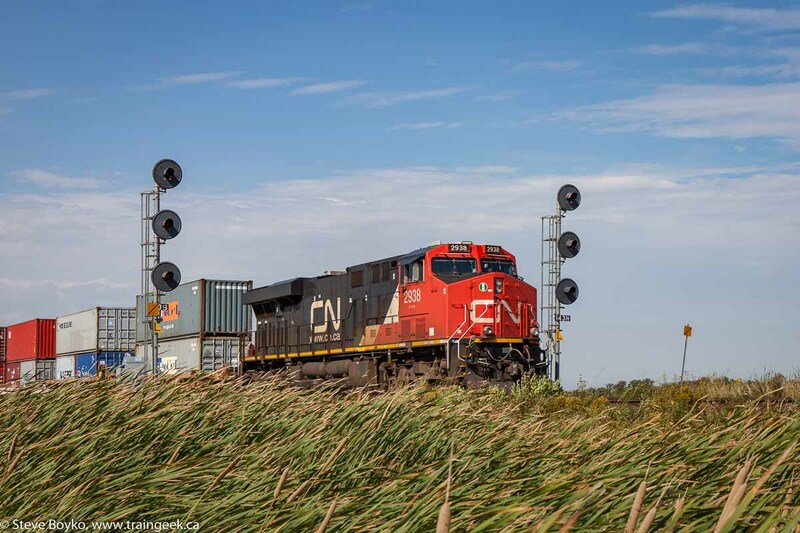 This CN 347 had CN 8924 and CN 5695 for power, followed by... nothing but centerbeam flats. Michael was a little closer to the tracks... though not as close as this might indicate. Empty car after empty car rolled by, seemingly without end. After what seemed like forever, but was actually only 3 1/2 minutes, the end of the train passed. 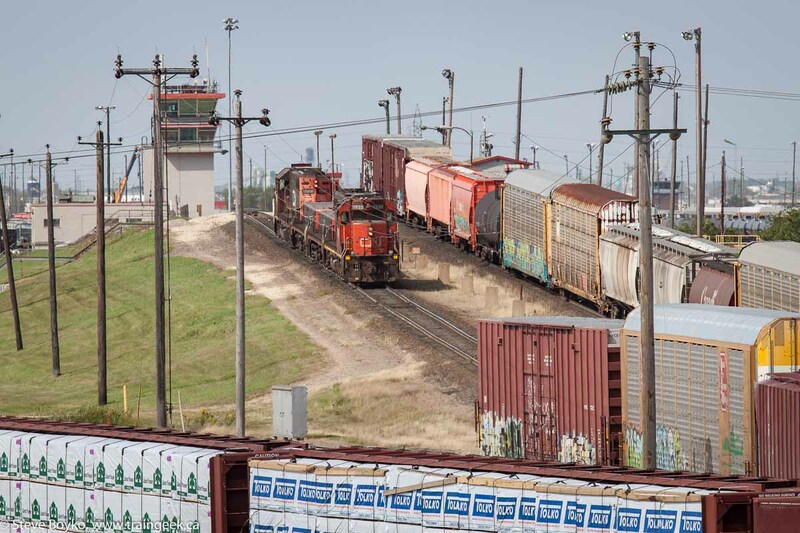 This was a good summer length train, two locomotives and 23 cars. It wasn't going as fast as I would have expected. I was very happy with the going-away shot. Glacier Park was beautiful in the early afternoon sun. Railpictures.net liked it. They also liked Michael's version of the same shot. Michael was listening on his scanner and he heard them call a "Clear to Stop" signal. I urged him to jump in the car and we set off in hot pursuit. Normally you can't chase VIA 1 as it is rolling along at 60 MPH or greater, but with a "Clear to Stop" indication, they would not be going too fast. We hurtled along the dirt road, observing the speed limit, and overtook the train within a couple of miles. We jumped out to get the second series of photos. There was a friendly table in the Acadian diner! I found it interesting to contrast Michael's shot choices with mine. In general we never stood beside each other and took the same photo. He seems to prefer a more head-on approach whereas I like the wide open vista photos. Maybe it's a city versus prairie perspective? After VIA 1 passed for the second time, we jumped back in the car and chased it for a few more kilometres. We came to the highway 424 crossing - with a stop sign - and I decided that would be it for the chase. 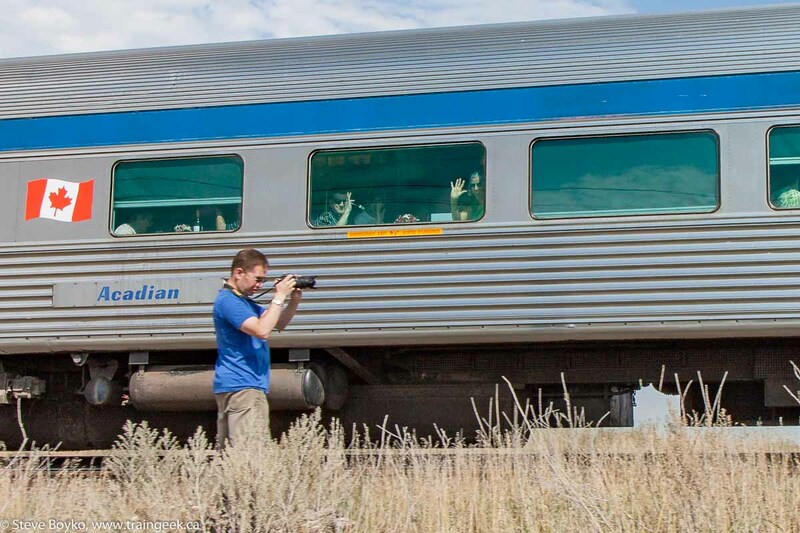 We bailed out once more and I shot video at the crossing while Michael took some more photos. We left Diamond after that, and as I was driving back toward where Michael was staying, we decided to take a few minutes to visit the hump at Symington Yard. This hump is one of the few hump yards still operating in Canada (CP's Winnipeg hump shut down several years ago) and there are usually three sets of power either at work or ready for work. This day was no exception. 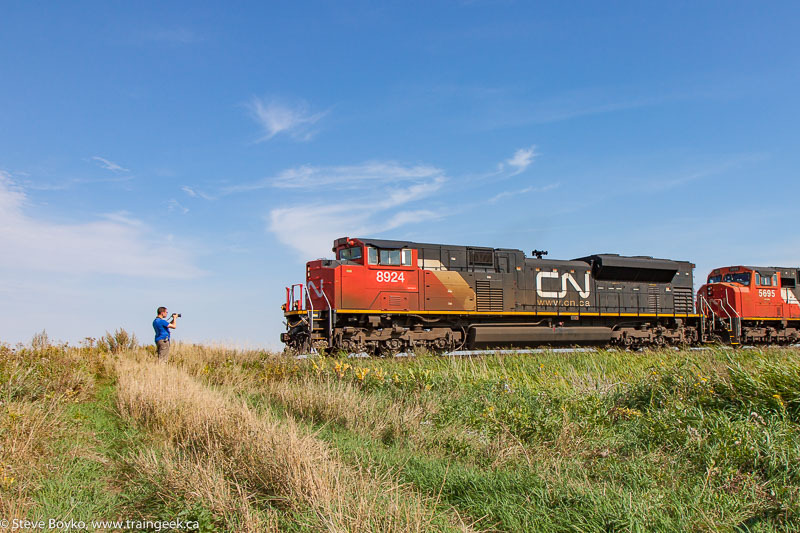 A set with CN 7522 / 7511 was on the hump itself. Another set with CN 7500 / 7513 was sitting to the side. The third set was pushing cars over the hump. This was the set that Michael was really looking for, the one with three SD40-2 units! CN 6015 / 6005 / 6012 and 225 were well down toward Navin. Slug and three SD40-2 units... what could be better? 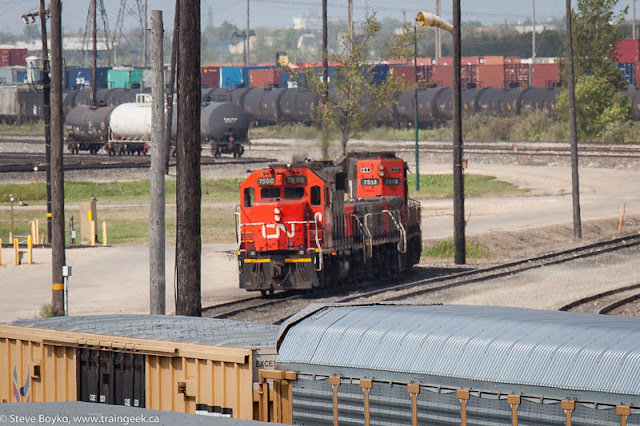 While we were looking at the hump set, CN 3047 was pulling south/east out of the yard. 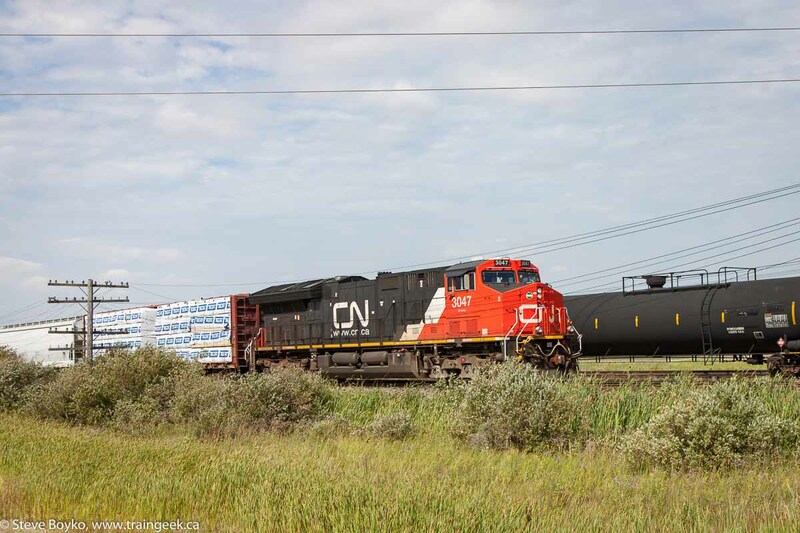 We believe this was train CN 438. That was the end of our time together, and I dropped Michael off to meet up with his family and I headed home to my own family. Railfanning is fun but family is way more important! We saw 7 trains over 6 hours, which is pretty good, I think. I hope Michael was pleased with his Diamond experience and I look forward to see more photos from him from this trip and from his normal Montreal railfanning! Thanks for reading and thank you Michael for the company and the experience.